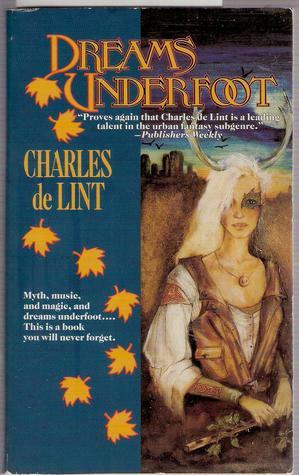 Dreams Underfoot, Charles de Lint, Tor, 1994 (c1993), ISBN 0-812-51621-4, $4.99, 459pp. No matter how much one reads, there’s always an author or two that always seems to manage to slip through the cracks. For me, it was de Lint. I had read some stories by de Lint in Year’s Best volumes, but never had picked up a novel or a collection. Spurred on by continual references to his writing on Rondua, and a recommendation from Alexlit (do you get the feeling that these two resources have been ruling my reading list lately? you’d be right), I picked up this collection of stories set in the fictional but familiar city of Newford. The term used to pigeonhole de Lint’s stories is “urban fantasy,” in that he places the creatures of fantasy–goblins, faeries, etc.–into a realistic cityscape. This differs from the magic realism approach because many of de Lint’s human characters are astonished to see the magic; in magic realism, the fantasy is taken as a given–as if it were normal. His major characters are a ragtag assortment of artists: Jilly Coppercorn, a painter and savior of strays; Christy Riddell, writer of fantasy stories and possibly de Lint’s alter ego; Geordie Riddell, busker (a street musician) fiddler; Meran and Cerin, wife and husband duo of harp and flute. I liked the stories, but had an initial unfavorable reaction to the entire book by the fawning introduction by Terri Windling, who also edited the book and did the cover art. It was lucky that the story containing a reference to Windling was halfway through the book, giving me enough of a taste of de Lint’s true style. If the reference had been in the first story, I would likely have tossed the book across the room. In a case such as this, I think it better to let the stories speak for themselves, or maybe the introduction would have been better as an afterword. To belabor the point, there’s a real danger in this almost incestial relationship between editor and author, writer and artist, creator and critic. Already walking a fine line by having a near alter-ego in Christy Riddell, the reader begins to wonder how much of this the author believes as fact or fiction himself. Self-referential comments are almost too precious, threatening the suspension of disbelief barrier, or at least, jarring the reader with the realization that they are reading, as in a film when the microphone boom dips into the shot. The fact that de Lint overcame this problem is all due to the stories. As I read them, I kept saying to myself, this is nothing special, this is nothing different. They are fantasy stories, pure and simple. Take an old tale, graft it with an urban setting, and voila. Except that the characters start living in your mind. You start to know what Jilly will say, or look forward to seeing Geordie step into another characters’ story. You start to feel for the characters, wanting the story to end with a happy ever after for them just like in a normal fairy tale, yet knowing that this is a different type of story. People get hurt, people suffer loss, people die. The two best tales here are the ones original to this collection: “In the House of My Enemy,” a story about child abuse, and “Ghosts of Wind and Shadow,” a tale of belief and self-knowledge. The ones I liked least were the ones that had been written for theme anthologies. De Lint was good at keeping the flavor of Newford in these stories, but each still lacked something that the ones not written to meet a certain theme had–something organic, as if he had needed to force or bend the theme stories slightly, making them a little out of wack compared to his others. Although I enjoyed the collection, I am looking forward to reading a novel by de Lint rather than more short stories. His is a style and manner that can easily benefit from the longer form, and I am anxious to see exactly how true that statement can be.